How can you lower cholesterol without resorting to medications? High cholesterol is considered a treatable risk factor for cardiovascular disease such as heart attacks and strokes. There are many nuances to cholesterol which I do not want to get into, but traditionally, the main division has been between Low Density Lipoprotein (LDL) or ‘bad’ cholesterol, and High Density Lipoprotein (HDL) or ‘good’ cholesterol. Many people do not look so closely at total cholesterol anymore, because there is both good and bad factions and therefore, the total cholesterol gives us little useful information. One might (mistakenly) think that decreasing dietary cholesterol may reduce blood cholesterol levels. However, 80% of the cholesterol in our blood is generated by the liver, so reducing dietary cholesterol is quite unsuccessful. Studies going back to Ancel Key’s original Seven Country Studies show that how much cholesterol we eat has very little to do with how much cholesterol is in the blood. Whatever else he got wrong, he got this right – eating cholesterol does not raise blood cholesterol. The next thought was that lowering dietary fat, especially saturated fats may help lower cholesterol. While untrue, there are still many who believe it. 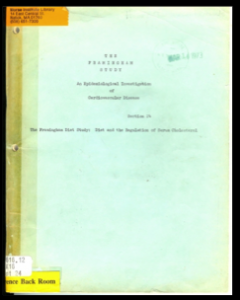 In the 1960’s the Framingham Diet Study was set up to specifically look for a connection between dietary fat and cholesterol. Why haven’t you heard of it, before? 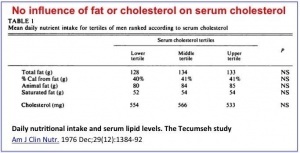 Well, the findings of this study showed no correlation between dietary fat and cholesterol whatsoever. Because these results clashed with the prevailing ‘wisdom’ of the time, they were suppressed and never published in a journal. Results were tabulated and put away in a dusty corner. The Tecumseh study divided their subjects into 3 levels of blood cholesterol – low, medium and high. Then, they looked at how much fat and cholesterol each group ate. It turns out that each group pretty much ate the same amount of fat, animal fats, saturated fats and cholesterol. So, what they demonstrated was that dietary intake of fat does not have very much to do with cholesterol at all. Low fat and extremely low fat diets can lower the LDL (bad cholesterol) slightly, but they also tend to lower the HDL (good cholesterol) so it is arguable whether things improve or not. Actually, we’ve known that for quite some time. 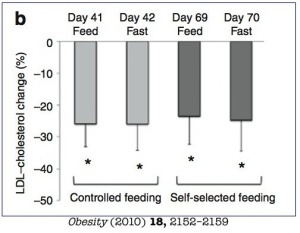 For example, here’s a study in 1995, where 50 subjects were fed either a 22% or a 39% fat diet. Baseline cholesterol was 173 mg/dl. After 50 days of a low fat diet, it plummeted to … 173 mg/dl. Oh. High fat diets don’t lower cholesterol either. After 50 days of high fat diets, cholesterol increased marginally to 177 mg/dl. Millions of people try a low fat or low cholesterol diet without realizing that these have already been proven to fail. I hear this all the time. Whenever somebody is told their cholesterol is high, they say “I don’t understand. I’ve cut out fatty foods”. Well, reducing dietary fat will not change your cholesterol. So, what to do? Statins, I guess? Now, there are many controversies about lipids that I do not wish to get quagmired in. I’m only going to discuss the conventional view of it. That is, many of the classic studies, such as the Framingham study, have pointed out that there is a correlation between high levels of ‘bad’ cholesterol and cardiovascular disease. The higher the LDL, the more bad things happen. ‘Good’ cholesterol (HDL) shows an inverse relationship. High levels are protective. So the lower the HDL, the higher the risk of CV disease. This association is actually much more powerful than that for LDL, so let’s start here. However, it is clear that HDL is not causally related to CV events. They are only a marker for disease. The studies were done. And the results were breathtaking. Breathtakingly bad, that is. The drug increased death rate by 25%. Yes, it was killing people left and right like Ted Bundy. Several more drugs of the same class were tested and had the same killing effect. Just one more illustration of the Correlation is not Causation truth. What happens to HDL during fasting? You can see from the graph that 70 days of alternate daily fasting had a minimal impact upon HDL levels. There was some decrease in HDL but it was minimal. The story of triglycerides (TG) is similar. While TGs may be correlated weakly to heart disease, they do not cause it. There were several drugs that reduce TG to a much greater extent than the cholesterol medications, the statins. Niacin was one such example. This drug would increase HDL and lower TG without very much effect on the LDL. The AIM HIGH study tested whether this would have any benefit. The results were stunning. Stunningly bad, that is. While they did not kill people, they did not help them either. And there were lots lot side effects. So, TG, like HDL is only a marker not a causer of disease. What happens to TG during fasting? There’s a huge 30% decrease in TG levels (good) during alternate daily fasting. In fact, triglycerides is quite sensitive to diet. But it is not reducing dietary fat or cholesterol that helps. Instead, reducing carbohydrates seems to be the main factor that reduces TG levels. The LDL story is much more contentious. Certainly, there is a correlation between high LDL levels and CV disease. However, the more important question is whether this is a causal relationship. The statin drugs lower LDL cholesterol quite powerfully, and also reduces CV disease in high risk patients. But these drugs have other effects, often called the pleiotropic (affecting multiple systems) effects. For example, statins also reduce inflammation, as shown by the reduction in hsCRP, an inflammatory marker. So, is it the cholesterol lowering or the pleiotropic effects that are responsible for the benefits? The way to low ever LDL is to make your body burn it off. The mistake of the low fat diet is this – feeding your body sugar instead of fat does not make the body burn fat – it only makes it burn sugar. The mistake of the Low Carb High Fat diet is this – giving your body lots of fat makes it burn fat, but it will burn what’s coming into the system (dietary fat). It won’t pull the fat out of the body. However, fasting always boils down to this. There’s all these benefits. There’s very little risk. What do you have to lose (other than a few pounds)? By the way, my cardiologist freaked when the saw the numbers based on the 4 day fast. They did not see the earlier numbers though (which I paid to have done myself). Also, even though the fasting glucose was very low for the 4 day fast, I had no idea it was that low. I suffered no ill effects. Is it being ‘released’ or being manufactured de novo? Since most cholesterol comes not from dietary sources but from in-house synthesis, why can we assume that fasting has not stimulated increased LDL production in such cases. I just took a test for life insurance and they were quite specific that I should NOT engage in heavy exercise the day before the test as it apparently throws readings into the “bad” range/ratio in a way they consider erroneous. (USAA is a good company that retests rather than turning people away, so they rather get a good result the first time.) If LDL is a repair mechanism for the vessels, then possibly the body responding by producing or releasing it is simply an evolutionary response that the exercise stimulates (heavy exercise = fighting off saber tooth cat etc)? This is alarming! I wonder if shorter daily IF fasts i:e 20:4 are a better option for some? See if you can get an NMR test instead of the VAP type tests, and look at the number and % of small dense LDL (instead of the “pattern A” vs. “pattern B”. Same for the HDL, there are more and less helpful types of HDL, like HDL1 and HDL2 corresponding to different sizes (the bigger the LDL or HDL, the more helpful). This is why there is a contradiction between the LDL number and the LDL pattern (bigger is better but causes the number to creep up). Same thing happened to me. I did the fasting mimicking diet (twice) went and had my lipid panel done a few weeks after and my total cool went up to 232! my HDL went down up slightly, my LDL went up from 96 to 149! and my Tri went up from 51 to 77. Very upsetting. Hi, Just adding a few comments here … after 3 major cardiac events over 10 years… And being told to go home and die.. Doctor could not believe results.. Stunned..
Hi Shane, did u sustain the results till now? Thanx! You should not fast for 3-5 days before taking a laboratory test. Join our membership community to see this topic in the Q&A’s and the reasons why. Great article, thank you again for all the time you invest for others. While we’re fixing typos – ” PCKS9 Inhibitors ” should read PCSK9 inhibitors. Thanks for presenting a clear and uncluttered approach to the lipid related benefits of fasting. Has our KOLs (key opinion leaders) got it all wrong? Why worry about total cholesterol, triglycerides, and LDL if the chorus of critics are right? Great harm has according to them be done by chasing the bystander of cardiovascular disease rather than its cause. It is like to use Prof. Ravnskov example blaming the fireman for being at the fire. Firstly I appreciate your incite into the complexities of the causes of diabetes and metabolic syndrome. I am asking for qualification on the statement that a LCHF diet will allow the use of dietary fat for energy but will not use stored body fat?ie pull the fat out of the body . Does this mean that calorie deficits are needed to use body fat regardless of the fuel used. 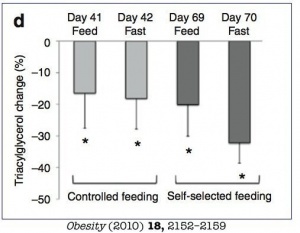 Also to achieve these deficits it is better to fast than to just lower calories. Thank you for any clarification of this. Dr. Fung, would that explain my chronic throat clearing? I have had this problem for about 10 years. I also snore very often. Ok. Fasting can give bad cholesterol results in the short term. So what would be required for long term results? How many times would you have to repeat a 4 day fast? Would it be better to have a longer fasting period? Would it be better to have many for short fasts? Dr. Fung, I really appreciate all the information you share with us. I have started following your program and look forward to reducing my insulin resistance. Do you feel that increasing resistant starch, by eating potato starch, wouldl help reduce insulin resistance? 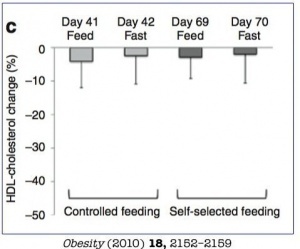 If so, would one consume potato starch on both fasting and feeding days? Thanks for all you do. Try losing 5 to 10 lbs. I know your not over weight but it’ll help your lipid panel I’d bet. Jimmy Moore says he’ll be using his proposed 30-40 day fast to scam his insurance company. Lower cholesterol numbers = lower rates. Sounds illegal to me. It is scammy, but it’s not illegal. Some smokers quit for a few days before applying for insurance, some people lose weight befor a weigh in, they mislead wrt the amount they exercise or drink, for example. Insurance companies are usually more concerned about declining cover (or charging higher rates) if your cholesterol is high, rather than giving discounts if it’s low. Maybe try minimizing the time you can run a mile. Don’t go for distance as the extra 15 kilograms will beat up your joints. A 9 minute mile would be a good initial goal. This will help your lipid panels, if that’s what you want. I, too, have had similar results with increase in my total cholesterol and LDL after a 5 day fast. My total cholesterol went from 257 to 297; my LDL went from 130 to 198. My HDL remained essentially unchanged from 74 to 75. I was so disappointed in the increase in numbers. I, too, wonder how long a fast is needed to see good changes, and if intermittent fasting will do the trick. Dr. Dung what kind of fasting do we have to do to see a drop in our LDL instead do an increase.. Your comment makes a lot of sense! May I ask a question? I need help. My cholesterol total is 460, HDL 84, TG 64, LDL 350, should I fast to reduce the cholesterol or take medicine first? Thank you very much. An animal adapts optimally to their environment is an axiom which certainly favours IF and paleo. Oxidized LDL is the real problem, not LDL per se. So it’ll be interesting to see how throwing the baby out with the bathwater with the new PCKS9 inhibitors will fare for long-term outcomes. My suspicion is it will trade one problem (CVD) for several others since LDL is critical for transporting lipids and nutrition systematically. After intermittent fasting for several months my triglicerides went down significantly (142 from 205); my HDL same( 65 was 66); LDL up significantly ( 250 up from 173) non hdl up (278 from 214). If I continue on this course of action will my liver adjust, and will my ldl normalize? My primary care physician wants to put me on statins. I am resistant to more medications. Your opinion? It’s been several months, and I was wondering if you continued the fasting, and how your latest blood work compares? Doing strictly Keto for 6 months without fasting, my blood results were outstanding on everything EXCEPT LDL cholesterol which was up significantly. I’m now doing one meal per day with Keto, and I’m curious to know how my blood results will change. Same problem for me. I did 16-8 IF, 5 days/week. Everything on my blood work are fine except LDL which is up to 240 from 180. Fasting is the one of the best way to lowering cholesterol, i suggest try fasting 2 days per week and see the result. It is great and worth to read. It removes all my doubts about cholesterol. When I was growing up I was taught by my parents to fast one day a month to maintain good health. I used to practice this but stopped for some unknown reason. Now that my health is suffering due to high cholesterol, I am going to start again. I really don’t want to go onto statins. Thank you. This is very helpful information. Cholesterol can be lowered through healthy diet and light workout. The diet must include soluble fibers that help flushing out bad cholesterol. Food high in saturated fats and sugar must be avoided. To easily keep a track of the diet consumed throughout the day, one can use health related apps such as Cholesterol Down app (http://www.drjanet.com/cholesterol-down-app.php) which is designed with a daily diet tracker and allows you to maintain your diet record.